Super Seven Wide Receiver Freaks of The 2018 Season And 2019 Draft Class. The 2019 Draft Class has Some of The Most Incredible Wide Receiver Freaks that I have ever seen, all of Them Could Become a #1 or #2 Draft Choice in The 2019 Draft Class. The Super Seven Freaks Include: A.J. Brown (#1) of Ole Miss, Parris Campbell of Ohio State, Deebo Samuel of South Carolina, K’Neal Harry of Arizona State, Marquise Brown of Oklahoma, Anthony Johnson of Buffalo, and David Sills V, of West Virginia. One of The Most Incredible Wide Receiver Freaks who will likely join Tight End Noah Fant on The 2018 All-American First Team, with Either Drew Lock of Missouri, Shea Patterson of Michigan, Jarrett Stidham of Auburn, or Justin Herbert of Oregon and that would be Ole Miss Wide Receiver A.J. Brown. And Incidentally, Brown (6-1, 225, 4.4) helped Quarterback Patterson get his Two 400-Yard Games for Ole Miss as he Caught 8 Passes for 233-Yards and 2 Touchdowns Against South Alabama in Game #1 and then in Game #2, he Caught 8 Passes again for 156-Yards and 2 more Touchdown Catches Against Tennessee-Martin. Then in Game #6, Against Vanderbilt, Brown Caught Another Incredible 8 Passes Again from Patterson, for 176-Yards and 2 More Touchdowns. Before Patterson Received his Knee Injury and then Transferred to Michigan. Later, in the Season, Against ULL, Brown Caught 14 Passes from Junior Quarterback Jordan Ta’amu, for 185-Yards, in helping Ta’amu Record his 418-Yards Passing-Game and Getting his Weekly MVP Award. Both Super True Sophomores, Patterson and Brown, were not Eligible To Be Drafted to The NFL until The 2019 NFL Draft and after The 2018 College Football Season. They will probably Never get To-Play Together Again, but they were The Best Passing Duo in The SEC and Possibly The Country for Three Games for The Ole Miss Rebels in The 2017 Football Season. In that First Game of The 2017 Season, Patterson Completed 28 of 35 Passes for 429-Yards and Four Touchdown Passes, with Brown Catching Eight of The Passes for 233-Yards and Two Touchdowns. The 233-Yards Receiving by Brown Set a New Ole Miss Single-Game Record in School History. Brown Finished his 2017 All-SEC Season with The Ole Miss Single-Season Record with 75 Catches for 1,252-Yards and 11 Touchdowns, while Averaging 104.3 yards per game. He also Recorded 29 Catches for 412-Yards and Two Touchdowns as a True Freshman in 2016. His Six 100-Yard Receiving Games Tied Laguon Treadwell in 2015. Brown gave All of The Ole Miss Opponents a Physical MisMatch Against Most Defenses in The 2017 Season. Brown (6-1, 225, 4.4) Led All SEC Teams with 129.7-Yards of Total Offense Per Game. NFL Teams will have to wait until The 2019 Draft to get their hands on these two 2017 Ole Miss Rebels, but Shea Patterson and A.J. Brown have already gotten All of The NFL Scouts Excited about The Possibility of Getting Them on their NFL Team. A.J. Brown Might be The #1 Wide Receiver in The 2019 Draft Class, but there are some other Incredible Super Athletic Receivers that Every NFL Scout wants on their NFL Team. After Evaluating Over 20 Wide Receivers for The 2018 Football Season and Potential Wide Receivers For The 2019 NFL Draft, I had Already Decided on My Final “SUPER SEVEN” and an Amazing Thing Happened. After my Evaluations, I had Originally had Rated and Ranked My Top “SUPER SEVEN” Players and I had all of them “In-Order” in The Story, but as I was Writing My Story, some of The Facts and Stats About The “SUPER SEVEN” made me Decide to Change The Order of The Rankings. After doing All of My Research and Deciding To-Change my Ranking Order, I Think That A.J. Brown is Still The #1 Wide Receiver, but I believe that The Other “SUPER SIX” are all Potential #1 Draft Choices and also Potential NFL Rookie Starters. All SUPER SEVEN are Super Freaks. I Have Listed The “SUPER SIX” in Alphabetical Order: Marquise Brown of Oklahoma, Parris Campbell of Ohio State, K’Neal Henry of Arizona State, Anthony Johnson of Buffalo, Deebo Samuel of South Carolina, and David Sills V of West Virginia are The “SUPER SIX” Super Freaks. Another Incredible Wide Receiver Freak is Oklahoma Sooner Slot Receiver Marquise Brown (#5) and he is Probably as Fast or Faster than Parris Campbell and He-Can and Will-Score “Any-Time” that he Touches The Football. As a True Sophomore, Brown had Some incredible Stats as he Recorded 57 Catches for 1,095-Yards and 7 Touchdowns and with an Outstanding 19.2-Yards Per Catch. Brown (5-11, 165, 4.26, 40, 3.95) has a Light-Body and Probably needs to get A-Little-Bit Bigger and Stronger “In Preparation” For The NFL, but he is So-Fast and So-Explosive, Every NFL Scout Wants him on Their NFL Team. It is Pretty Unique that Marquise “Hollywood” Brown is From South Broward High School in Hollywood, Florida. Then, out of High School, Brown Went to College of The Canyons Junior College in Santa Clarita, California where he was an Unbelievable Freak in Every Single Game He Played-In. Brown (#6) was a Total Freak at The Canyons Community College as he Recorded 50 Catches for 816-Yards and 10 Touchdowns; Returned 13 Kickoffs for 402-Yards and a Touchdown; and Returned 9 Punts for another 182-Yards and a Touchdown. His Final Stats 16.3-Yards Per Catch and 1,400-Yards of Total Offense and 12 Touchdowns. The Marquise Brown Recruiting Story has got to be One of The Most Interesting and Most Intriguing Stories of All-Time. Head Football Coach Ted Iacenda, of The College of the Canyons, in Santa Clarita, California, Located 2,000-Miles from The Brown Home in Hollywood, Florida in South Florida, was Recruiting a Teammate of Brown and Coach Iacenda heard that his Friend Could Really Play. “We were like, ‘Yeah, sure, We’ll take a look at him,” Iacenda said. “My Wide Receivers Coach looked at His Highlight Tape and then told me, “Man, this kid is Really Good.” Iacenda and his Coaching Staff tried to sign Brown before The 2015 Football Season, but Brown’s Mother was Apprehensive about sending her son all the way to California, but by the end of that 2015 Season, during which Brown did not play football at all, his Mother’s Fears had subsided enough to put him on a plane and Headed West to California. California Junior Colleges Do Not Offer Scholarships, so Brown had to find a way to Make Some Money while pursuing His Dream of playing for a Power 5 College. Coach Iacenda Directed a handful of his players to the nearby Amusement Park, Six Flags, for exactly that purpose. Brown, however, Did Not have a car or a bike, so he had to walk to work. After his True Freshman Year at The Canyons, Brown was Ranked as The #10 Junior College Player in 2016 and The #3 Wide Receiver in The JUCO Ranks. Brown was also One of The Hottest Junior College Recruits In The Country and he Chose The Oklahoma Sooners over Southern Cal, West Virginia, North Carolina, Arizona State, Oregon, Tennessee, Nebraska, California, Kentucky, Middle Tennessee, and TCU. 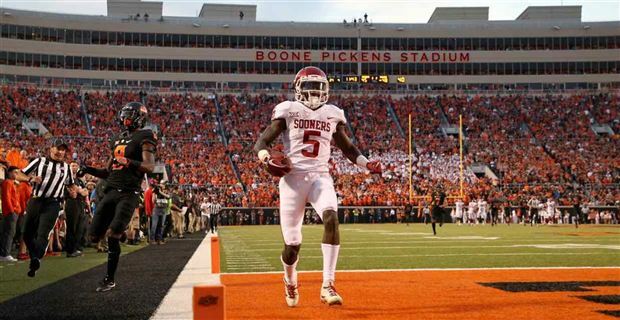 In 2017, As a Sooner True Sophomore, Marquise Brown Continued his Freaky Ability To-Make Big Plays. In Game #3, Against Tulane, Brown Had a Career-High with 6 Catches for 155-Yards, including an Incredible 87-Yard Touchdown Catch in The Fourth Quarter in a 56-14 Victory. Then, a Few Games Later, in Game #7, Against Kansas State, Brown Caught another 6 Passes for 126-Yards. Then in Game #9, In The Big Game Against Oklahoma State, Which was on National Television and I Watched it, Brown Broke His Career-High Again as well and he also Broke The Sooner School Record, with 9 Catches for an Unbelievable and Incredible 265-Yards and Two Touchdowns, including Touchdown Catches of 84-Yards and 77-Yards in Helping Heisman Trophy Award Winner, Baker Mayfield and The Sooner Offense to Record 785-Yards of Total Offense. That 785-Yards of Total Offense Tied for Fourth Place in Oklahoma School History. One of The Biggest Wide Receiver Freaks in The 2019 Draft Class is Ohio State Wide Receiver and Kick-Returner Parris Campbell and he also Might be One of The Fastest Players in The 2019 Draft. In a Recent Camp, Campbell Recorded a Hand-Held 4.26 in The Forty. Even on The Unbelievable Top-Rated Ohio State Roster and a Buckeye Squad that is filled with Incredible Talent, Campbell (#21) has Incredible Speed Measurables. With a 40-Inch Vertical Jump and a 135-Inch Standing Broad Jump, his Measurables and MEARS RATING is Comparable to 2018 #1 Rated Draft Choice RB Saquon Barkley, who had The #1 MEARS RATING in The 2018 Draft Class with a 2,906 MEARS RATING and TE Noah Fant of Iowa who has a 2.874 MEARS RATING and who is also in The 2019 Draft Class. Both of These Measurables, along with his 4.26 in The Forty, Campbell Would Record an Incredible and Mind-Boggling 2,891 MEARS RATING and that would Place him as The #1 Wide Receiver at The 2018 NFL Scouting Combine, but he was not Invited. It is Not Surprising that Campbell (6-0, 208, 4.26, 40) is one of The Most Impressive Kick-Returners in The Country and with a Career Average of 36.6-Yards Per Kick Return. In 2017, Campbell Returned 9 Kickoffs and with a Long Return of 82-Yards. In Game #1, Against Indiana, Campbell Rushed for 6-Yards, Caught 6 Passes for 136-Yards and a Touchdown, and Returned 2 Kickoffs for 50-Yards, giving him 192-Yards of Total Offense and a Touchdown. Then, in Game #4, Against UNLV, Campbell Caught 3 Passes for 105-Yards and a Touchdown and Returned one Kickoff for 82-Yards, giving him 187-Yards and a Touchdown. Campbell Battled Nagging Injuries late in The 2017 Season, but he still Caught 40 Passes for 584-Yards and Three Touchdowns. In One of his Biggest Games, Campbell Grabbed a Screen-Pass and Sprinted 57-Yards for a Touchdown that gave The Buckeyes a Lead that they Never Relinquished in their Huge 27-21 Big Ten Championship Game Against Wisconsin. Campbell also received work out of The Buckeyes Backfield, with 10 Carries for 132-Yards and a Touchdown. His most impressive showing came in The Buckeyes 49-21 Opening Game Victory over Indiana, when he recorded Six Catches for 136-Yards and a Touchdown. The 2017 Season was a “Breakout-Season” for Campbell, who Red-Shirted as a True-Freshman in The 2014 Season. Campbell played sparingly in The 2015 Season, but he Developed into one of the Top Kickoff Returners in The Big Ten as a Red-Shirt Sophomore, leading The Big-10 Conference with a 27.8-Yards Average Per Kickoff Return. In 2016, Campbell Recorded the Third-Most Return Yardage of 584-Yards in Buckeyes School History and he was Named as a Third Team All-Big Ten Kick Return Specialist. Arizona State Super-Star N’Keal Harry (#1) is another Wide Receiver and as you can See, he is a Total Freak. One of The Most Interesting Things about The 2017 Football Season was that I was able To Watch and Evaluate The Ole Miss Super-Stars, A.J. Brown and Shea Patterson, Play on Television in their Opening Game of The Season and then in Game #3, I was able to Watch and Evaluate Super-Star Wide Receiver N‘Keal Harry, on Television, Against The Texas Tech Red Raiders. I was also able To Watch and Evaluate Red Raider Quarterback Nic Shimonek Pass for 543-Yards and also Red Raider Wide Receiver Keke Coutee Catch 12 Passes for 186-Yards and a Touchdown. I was Very Impressed with Both Shimonek and Coutee, but this Arizona State Freak Named N’Keal Harry might have been The Most Impressive Player in The Game as he Caught 13 Passes for 148-Yards and a Touchdown. I had Forgotten that N’Keal Harry was a Five-Star Recruit, and I also forgot that he was not an Average High School Football Recruit, because he Was Rated as The #1 Wide Receiver in The Country, in The 2016 Recruiting Class, by a Couple of Recruiting Services. The Most Amazing Thing About N’Keal Harry is that he is not From The United States. He was Born on a Tiny Island Called St. Vincent with a 109,806 Population in The Caribbean and he and His Grandmother Moved to Chandler, Arizona with a 251,163 Population when he was Four-Years Old. His family wanted him to move to The United States in hopes of a Better Life and Better Opportunities. Another Unbelievable Thing is that N’Keal Harry is an Incredible, Revolutionary Athlete for His Country and he is, Without a Doubt, The First Person from St Vincent To-Play College Football in The United States and he will also be The First Person from St Vincent To-Play in The NFL. In The 2016 Season, N’Keal (#1) Earned Freshman All-American and he also Set The Arizona State Freshman Record as he Recorded 58 Catches. Also, as a True Freshman, Harry became only The Ninth Sun Devil in History To Start as a True Freshman in The Season Opener and To Add To This Record, he Caught 4 Passes for 34-Yards and he also Scored on a 34-Yard Run. Harry (6-4, 220, 4.42) does not look like a True Freshman in this Photo or on his True Freshman Highlight Film. N’Keal (Pronounced Nuh-Keel) is Unbelievable Strong and Mature. On his High School Highlight Film, he Runs Over Player-After-Player. On One Play, he Ran-Over Six Players and Scored a Touchdown as he Reached-Out with The Football into The end-Zone and then on Another Play, he Caught a 5-Yard Pass and broke Three or Four Tackles and Raced for a 35-Yard Touchdown. Then In 2017, After his Sensational Sophomore Football Season, Harry Was Voted to The PAC-10 All-Conference First Team after he Caught 82 Passes for 1,142-Yards and 8 Touchdowns, with a 13.9-Yards Per Catch Average. These Sophomore Stats In 2017, Were Added to His Incredible True Freshman Stats In 2016, After he Caught 58 Passes for 659-Yards and 5 Touchdowns. His Two-Year Career Totals include 140 Catches for 1,801-Yards, with 13 Touchdowns and a 12.9-Yards Per Catch Average. These Incredible Two-Year Career Totals are Unbelievable. First of all, N’Keal Harry is The Only True Sophomore Football Player in The Country To-Have Caught a Pass in his first 24 Games of his College Career. The Buffalo Bulls Unbelievable Wide Receiver Anthony Johnson (#83) Returns for his Senior 2018 Season and he is Another Super Freak, as he will be The Country Returning Leader in Pass-Receiving Yards with 1,356-Yards; Second in The Country in Touchdowns with 14 Touchdowns; and Third Among MAC Conference Wide Receivers in Passer Rating when Targeted. Anthony Johnson has Already been named to The 2018 Maxwell Award List, which Recognizes The #1 Football Player in The Country. Meanwhile, his Buffalo Inside Linebacker Teammate, Khalil Hodge, has Already Been Named to The 2018 Bednarik Award Watch List, given Annually to The #1 Defensive Player in The Country. The Former Rock Hill South Pointe, South Carolina Stallion Super-Star Wide Receiver opened The 2017 Football Season with 11 catches for 140-Yards and a Touchdown Against The Big Ten Minnesota Gophers. Johnson, then proceeded to have Eight Games with at least Six Catches and in Six Games with 100-Yards or More. His Final 2017 Pass Receiving Stats Included 76 Pass Catches for 1,356-Yards and 14 Touchdowns. His 17.8-Yards Per Catch was Outstanding; Especially when he was Double and Triple-Teamed on Every Single Play. In The Final Three Games of The 2017 Football Season, Anthony Johnson was Incredible and Mind-Boggling as he Caught Passes For 468-Yards Receiving and Eight Touchdowns in All Three Buffalo Victories. Only The Fred Biletnikoff Award Winner James Washington Averaged more Yards Receiving Per Game Than Anthony Johnson in 2017. In those Final Three Games in 2017, Johnson Caught 8 Passes for 160-Yards and 2 Touchdowns in a 38-28 Victory over Bowling Green; Caught 7 Passes for 153-Yards and 4 Touchdowns in a 40-24 Victory over Ball State; and Caught 6 Passes for 155-Yards and 2 Touchdowns in a 31-24 Victory over Ohio. In those Three Games For The Bulls, Johnson also Averaged an Incredible 22.29-Yards Per Catch. With Such an Outstanding Junior Season in 2017, there was A Lot of Thinking that Anthony Johnson would go in The 2018 NFL Draft, but he Decided to Come-Back For his Senior Season and he Returns in 2018 as The #1 Wide Receiver in The Country in Yards and Second in the Country with 14 Touchdowns. In 2017, Johnson (6-2, 207, 4.4) was named to The Pro Football Focus First Team All-American Team and also to The First Team All-MAC Conference Team, after leading The MAC Conference in Receiving Yards Per Game with 113-Yards and Receiving Touchdowns with 14 Touchdowns. Johnson was forced To-Go To Junior College, because he had Too Many Distractions and he did not Focus on his Grades. Johnson Spent One Year at Butler Junior College in Kansas and One Year at Iowa Western Community College in Iowa. After Leaving Iowa Western, Johnson had Interest from The Big 12 and The SEC, but Conference Rules Prevented Those Schools From Offering Him. He Also Graduated Late in The Recruiting Season and Signed With The Buffalo Bulls. The Bulls Head Coach Lance Leipold Wanted to Red-Shirt Johnson, because he was Nursing a Nagging Injury, but Johnson did not want to Red-Shirt. In one of The Most Incredible Kickoff Return Performances of The 2017 Season or any Season were in The First Two Games of The South Carolina Football Season. In those First Two Winning Games of The Season Against North Carolina State and Missouri, South Carolina Super All-Star Athlete Deebo Samuel (#1) Returned a 97-Yard Kickoff For a Touchdown in Both Games. At some point, opponents are going to stop kicking to South Carolina Super-Star Deebo Samuel. Up-Until Then, The Gamecocks were Happy to get any Extra Yardage, but these Two Kick-Returns were not only for Extra Yardage, these Two Returns were Game-Changing Kick Returns From their All-Purpose Super-Star. In The Opening Game of The Season, Against North Carolina State, Samuel had Already Returned The Opening Kickoff 97-Yards for a Touchdown and had also had Caught a 6-Yard Touchdown Pass in The Second Quarter from Quarterback Jake Bentley. Then, with 11:54 Left in the Third Quarter, and The Score Tied at 21-21, Bentley Rolled-Out of the Pocket and Threw a Pass Deep Downfield in the Direction of a Streaking Samuel and although the Football was Thrown Over-His-Head, Bentley had Complete Confidence that his Favorite Receiver would Catch The Football for Another Gamecock Touchdown. “If Samuel would have dropped that pass in the End-Zone, I might have killed him,” Bentley said Laughingly, but Samuel Reached-Out With One-Hand and Caught The Football One-Handed in the Corner of the End-Zone for a 39-Yard Touchdown Catch, giving South Carolina The Lead at 28-21 in Leading-Them to a 35-28 Victory over North Carolina State in The Season Opener for Both Teams. “He probably won’t say it, but I don’t think anyone in the country can Guard-Him,” Bentley said of Samuel. In this North Carolina State Game, Samuel Rushed One Time for 5-Yards, Caught 5 Passes for 83-Yards and Two Touchdowns, and Returned The Opening Kickoff 97-Yards, giving him 185-Yards of Total Offense and Three Touchdowns and a Weekly MVP Award. Then in The Second Game of The Season, against Missouri, Deebo Samuel Returned another 97-Yard Kickoff for a Touchdown, helping South Carolina To Erase an Early Lead To Beat Missouri 31-13 in The SEC Conference Opener for both teams. In The Second Quarter and The Missouri Tigers with a 10-0 Lead, Samuel Returned His 97-Yard Kickoff, cutting The Missouri Lead to 10-7. Then, a Few Minutes Later, Samuel Raced 25-Yards for another Touchdown and gave The Gamecocks a 14-10 Lead on their way to Their 31-13 Victory. In this Second Game, Samuel Rushed for 25-Yards and a Touchdown; Caught 5 Passes for 45-Yards; and had One Kickoff Return for 97-Yards and a Touchdown, giving him 167-Yards of Total Offense and Two Touchdowns. In the Third Game of The 2017 Season, Against Kentucky, Samuel had Five Pass Catches for 122-Yards and Scored His Sixth Touchdown of the Season, But he left the game in the Third Quarter with a Broken Leg and he Missed the Rest of The 2017 Season. Samuel (5-11, 215, 4.4) was voted as The South Carolina MVP in The 2016 Season in which he Caught 59 Passes for 783-Yards and a Touchdown and he Rushed for 98-Yards and also Scored 6 Rushing Touchdowns in 10 Games. Samuel was also Third in The SEC in Pass Catches and Averaged 5.9 Catches Per Game. If Samuel can stay on the field for every game in The 2018 Football Season, it will become Great News for The South Carolina Gamecocks Football Team, but The Greatest News would be for Deebo Samuel on 2019 Draft Day. Super-Star Wide Receiver David Sills V (#13) and Super-Star Quarterback Will Grier (#7) are Both Returning to West Virginia for The 2018 Season! All of The Big-12 Teams are Certainly Aware of This Sensational Passing Duo and What they can do For The West Virginia Mountaineers. Oklahoma State Wide Receiver James Washington was Named as The 2017 Biletnikoff Award Winner, while West Virginia Wide Receiver David Sills V Finished as a Runner-Up. Sills V (6-4, 205, 4.48) Caught 60 Passes for 980-Yards and an Incredible National-Leading 18 Touchdowns in 2017 and he Joined A.J. Brown, Marquis Brown, K’Neal Harry, Anthony Johnson, and Deebo Samuel as being Named as a 2017 Fred Biletnikoff Award Finalist. West Virginia Head Football Coach Dana Holgorsen has High Expectations for his 2018 Mountaineers Team That Features Two Heisman Trophy Candidates (Grier and Sills V) and a 2017 Fred Biletnikoff Runner-Up Finalist (Sills V) on Offense, a Second Team 2017 All American Weakside Linebacker (David Long) on Defense and Experience at Every Position. One of The Fascinating Facts about West Virginia Head Coach Dana Holgorsen is that he and I were Good Friends when he was Wide Receiver Coach for Head Coach Mike Leach at Texas Tech. I was with The Texas Tech Red Raider Team when they Played in The Alamo Bowl Game in 2001 and again in 2002 when they played in The Tangerine Bowl Game. Coach Holgorsen Brought The Texas Tech “Air-Raid” Offense with him To The Mountaineers Offense that Grier and Sills V Run-To-Perfection. Sports Illustrated has Just Named Their Dark Horses for The 2018 Heisman Trophy and there is a West Virginia Football Player on the Watch List and The Player is not Quarterback Will Grier. Wide Receiver David Sills V Took The Country By Storm in 2017 With 18 Touchdown Catches and Sports Illustrated thinks that David Sill V Could challenge all of The Super-Star Quarterbacks, including Drew Lock, Shea Patterson, Justin Herbert, Jarrett Stidham, and his West Virginia Teammate, Will Grier for the Heisman Trophy Award in The 2018 Football Season. Grier is Probably the Better-Bet in Getting The Heisman Trophy, than Sills V, but if Sills V can have another Super Season like he had in The 2017 Season, he could “Very-Well” be on The Heisman Trophy Watch List. As already Mentioned. In The 2016 Season, Sills was also on The 2017 Fred Biletnikoff Award Watch List and he also was a Finalist. Only Three Wide Receivers have Won The Heisman Trophy Award, including Johnny Rodgers of Nebraska in 1971; Tim Brown of Notre Dame in 1987; and Desmond Howard of Michigan in 1991. The Most Amazing Thing About This Story is that No Wide Receivers have won The Heisman Award in The Last 27-Years, but There Have Not been very many Wide Receivers that Produced The 2017 Pass Receiving Stats That Sills V Produced in such a Short-Time at Playing Wide Receiver. The David Sills V Story is also one of The Most Intriguing Stories in all of College Football in both The 2017 and 2018 Football Seasons. Sills V Made Unbelievable History in 2010, as a Seventh Grade Quarterback, when he was Offered a Scholarship To-Play Football at Southern California by Coach Lane Kiffin. Sills V got More Incredible National Attention, when he gave The Trojans a Verbal Commitment To Play Football for Southern Cal. Then in 2014, Sills V Decommitted from Southern Cal and in 2015, David Sills VSigned a National Letter of Intent To Play for West Virginia as a Quarterback. So Sills began his College Career as a Quarterback in The West Virginia “Air-Raid” Offense, but after a few games on The Scout Team as a Wide Receiver, Coach Dana Holgorsen Moved Wide Receiver Sills V Up to The Varsity. On October 17, 2015, in Game #6 For West Virginia, Sills V made his Collegiate Debut against The Baylor Bears and in That Game, Sills V Caught 2 Passes for 64-Yards. His Second Collegiate Catch was an Incredible 35-Yard Touchdown-Catch. This Catch was an Unbelievable Catch, but Later in the Season, in The 2016 Cactus Bowl Against Arizona State, and K’Neal Harry, he made the Game-Winning Touchdown Catch and Ended his True Freshman Season with 7 Catches for 131-Yards. Then During 2016 Spring Training, Sills V Divided His Time Between Quarterback and Wide Receiver, but After The 2016 West Virginia Spring Game, his Chances of Playing Quarterback were Very Low. With Two Quarterbacks Ahead of him, on The Depth Chart and Former Florida Starting Quarterback Will Grier Scheduled to Become Eligible to play for The Mountaineers in 2017, it Appeared Highly Unlikely that Sills V would ever get a Chance To-Play Quarterback at West Virginia. With all of This in Mind, Sills V Decided to Transfer to a Junior College. In June 2016, after West Virginia Spring Training, Sills V Announced that he would be Transferring to El Camino Community College. In his Only Football Season, as a True Sophomore, at El Camino Community College, Sills V Played Quarterback, not Wide Receiver. and he Passed for 1,636-Yards and 15 Touchdowns. Then, On December 15, 2016, The West Virginia Football Team Announced that Sills V would be Transferring-Back to The West Virginia Mountaineers and Soon-After in The 2017 West Virginia Spring Game, Sills V Played Wide Receiver and he Caught 6 Passes for 98-Yards from Quarterback Will Grier. Wide Receiver David Sills V Took The Country By Storm in 2017 With 18 Touchdown Catches and Most of These Touchdown Catches were in The Incredible Class Mode. Sills V has also taken his Pass-Catching Game to a Complete Whole New Level. Or levels rarely seen in College Football.